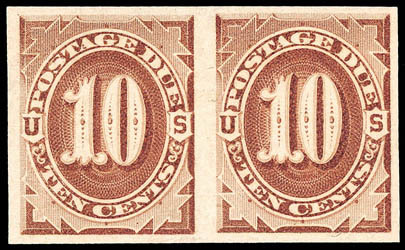 Postage Due, 1879, 10¢ brown, imperf, horizontal pair, full o.g., fairly light hinging, full well balanced margins, fresh with rich vibrant color, Very Fine and choice; with photocopy of 1991 P.F. certificate for block. AN EXTREMELY RARE EXAMPLE OF THE 1879, 10¢ POSTAGE DUE IMPERFORATE ISSUE. It is believed that no more than 23 pairs exist, however a search in the P.F. certificate records shows that only a vertical pair, a strip of three and a block (which this pair came from) have ever been certified. Postage Due, 1879, 30¢ brown, o.g., never hinged, near perfect centering with beautifully balanced margins around, strong bright color and very fresh, Extremely Fine and choice, this is the only never hinged example to grade as such with none higher; with 2015 P.S.E. Graded certificate (XF 90, SMQ $2,500). 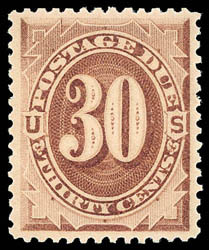 CONSIDERED TO BE THE FINEST NEVER HINGED EXAMPLE OF THE 1879 30¢ POSTAGE DUE ISSUE IN EXISTENCE. Postage Due, 1884, 5¢ red brown, o.g., lightly hinged twice, choice centering within well balanced margins, rich color enhancing a sharp proof-like impression, remarkable freshness, Extremely Fine to Superb, a wonderful mint gem; with 2012 P.S.E. Graded certificate (XF-Sup 95, SMQ $1,500). 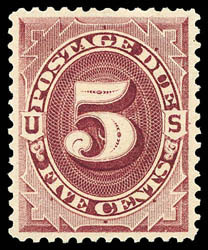 Postage Due, 1884, 10¢ red brown, o.g., never hinged, perfectly centered amid large evenly balanced margins, rich deep color enhancing a crisp detailed impression, a Superb gem, the only example to receive this lofty P.S.E. grade with none higher; with 2013 P.F., P.S.A.G. Graded (100) certificate and 2015 P.S.E. Graded certificate (Superb 98, SMQ $8,000). 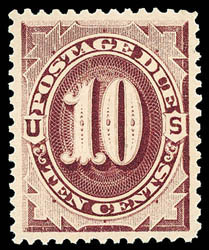 REGARDED AS THE FINEST NEVER HINGED EXAMPLE OF THE 1884 10¢ POSTAGE DUE ISSUE IN EXISTENCE. In the P.S.E. Population Report, there is listed two never hinged examples receiving the 98 grade. However this is a duplication of this stamp (2011 P.S.E. cert #1235986 and 2015 P.S.E. cert #1302634).